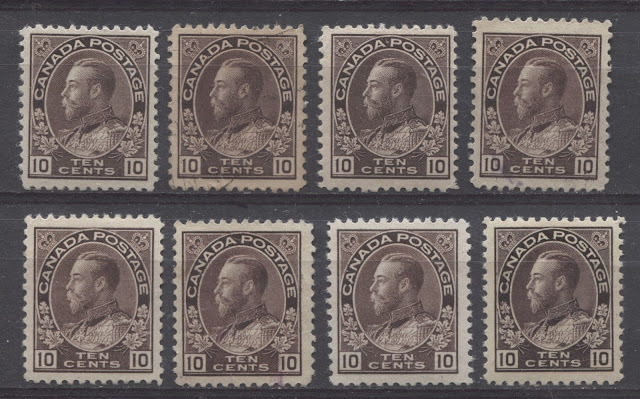 This stamp was released in January 1912 and replaced the 10c King Edward VII stamp. It's use was primarily for insurance fees on registered mail, bulk mailings of printed matter and parcels. 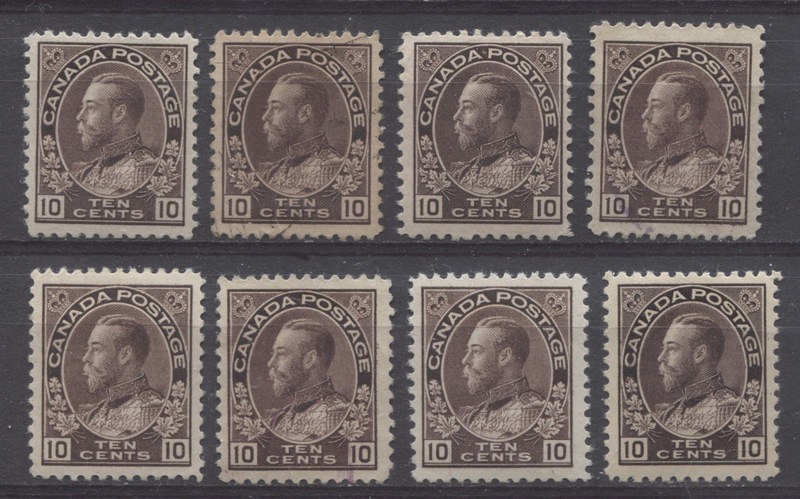 Consequently, it was in fair demand, and a lot of printings were made between 1912 and 1922, when it was replaced by the 10c blue. The what most people think of when they hear "plum" are the more common brownish purple and purple brown shades, that were from printings made after 1920. Indeed most mint examples are from that time period, with examples from 1912-1914 being comparatively scarce. 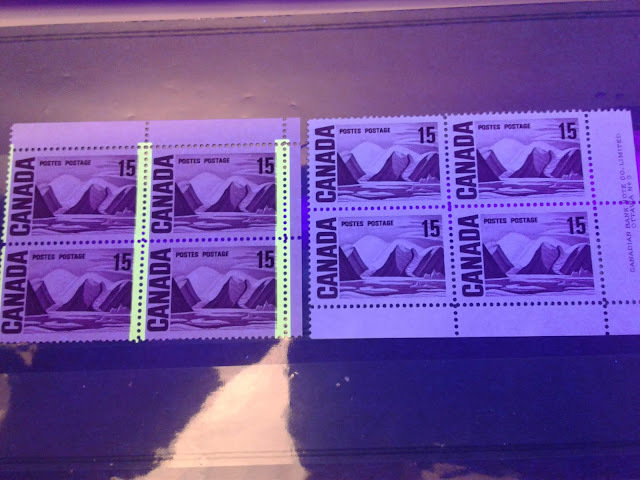 Unitrade identifies the reddish purple shade as coming from the first printings in 1912, which is correct, but a number of early printings from 1912-1913 can be found in a dull greyish purple shade as we shall see. Dark purple brown - similar to purple brown, but containing some black. Deep dull greyish purple - similar to dull purple, but deeper and greyer. Dull greyish purple - similar to dull purple, but greyish. Dark purple brown - similar to purple brown, but with a hint of black. Deep brown purple - similar to brown purple, but deeper. Dark purple brown - similar to brown purple, but with black added. Blackish plum - similar to plum, but with black added. 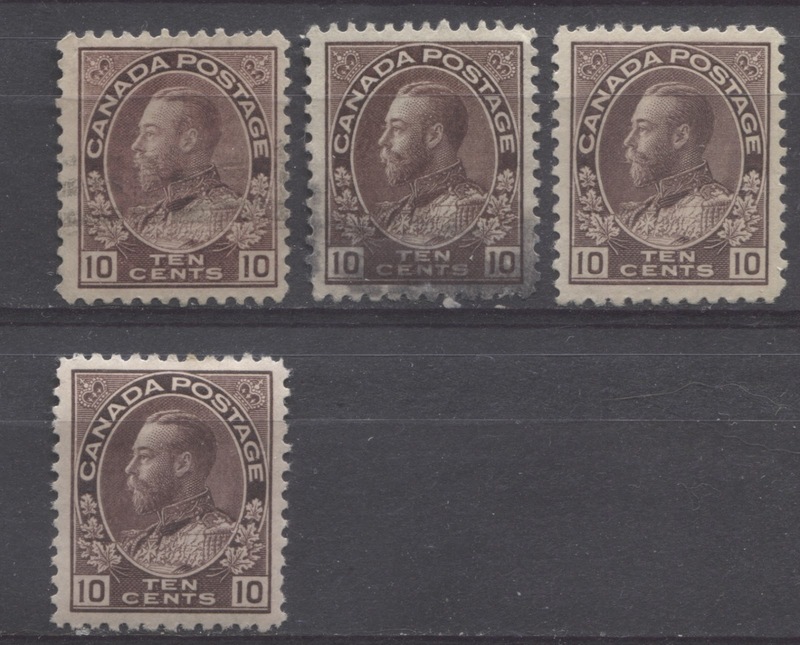 The greyish purple shades have paper and gum that is consistent with printings made before 1914, while the blackish plum has paper and gum consistent with 1915-1917 printings. Finally the other shades have paper and gum consistent with printings made after 1918. Light maroon - similar to maroon, but with some white added. Dull greyish purple - similar to greyish purple, but dull. 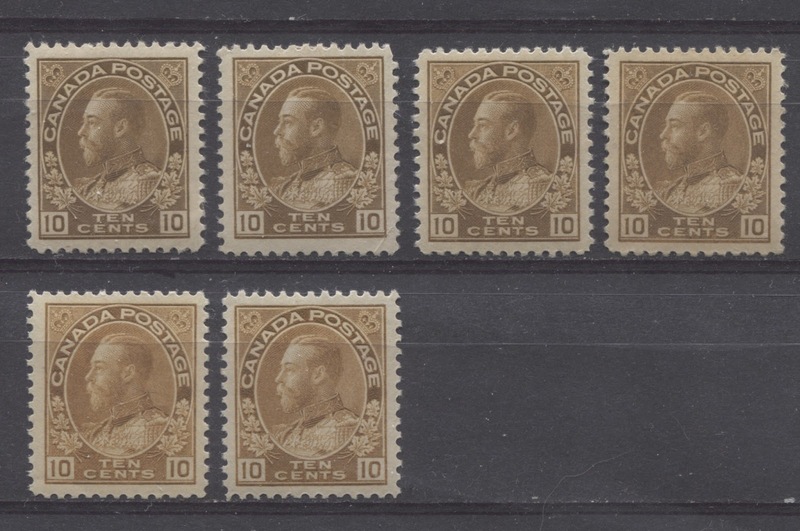 The paper and gum characteristics of all these stamps are consistent with printings made before 1914, which supports Unitrade's assertion that these are from the first printings. This stamp replaced the 10c blue in 1925 and by the time it was issued, its use had expanded to include other post office services like acknowledgement or receipt and the like. So again, it saw very heavy use. Surprisingly, there are quite a few subtle shades of this stamp, although they are all very similar to one another, due largely to the fact that they were only printed by the dry method, which appears to result in less marked shade varieties than one finds on the wet printings. Light bistre brown - similar to bistre brown, but with a touch of white. Pale bistre brown - similar to above but less intense. Deep ochre - similar to ochre, but more intense. Light yellow brown - similar to yellow brown, but with white added.